On August 2, two Trump Administration priorities became public that will undermine civil rights, racial justice, and diversity in the United States. CAA immediately responded with a press conference to denounce these actions. 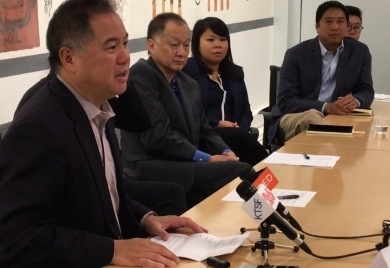 Assemblymember Phil Ting, a representative for Assemblymember David Chiu, and several civil rights leaders gathered at CAA’s headquarters to speak to reporters. First, the Administration endorsed the RAISE Act, which would choke legal immigration by reducing refugee admissions, limiting family-based petitions, and eliminating the Diversity Immigrant Visa Program. Cutting legal immigration in half over the next decade as the Act proposes would decimate the Asian American community and make the wait lines that are already so harmful even worse. Second, the U.S. Department of Justice plans to sue universities to end race-conscious and other affirmative action programs. Affirmative action programs are designed to promote diversity and ensure equity for disadvantaged groups, and have for decades improved college-going for communities of color including Asian Americans. It’s important to note that both of these actions come straight out of Trump’s strategy to scapegoat and blame immigrants and communities of color. These policy proposals are intended to play to his most right wing, white nationalist base. It’s important not to be fooled into thinking these policies and proposals are just about attacking undocumented immigrants. What they are really trying to do is eliminate all immigration. Community members with any questions related to immigration are encouraged to contact us and get the right information. Our bilingual hotline is 415-761-3222. We will also be posting dates of educational workshops on our website. All services are provided free to the community.